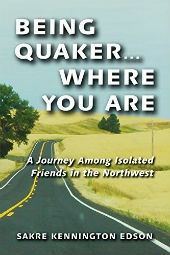 A record of visits with “all isolated Friends listed” in North Pacific Yearly Meeting of the Religious Society of Friends, this book reveals a wide variety of spiritual practices among them and gives witness to the many ways that service, simplicity, seeking, and wonder can result in a successful spiritual life. Far from community, these Friends use silence and stillness as wells of replenishment and sources of Light. They offer helpful examples of ways to maintain one’s faith in the midst of isolation, finding the strength to begin anew and an anchor for good works in the beauty of all creation. Includes nearly sixty interviews with Friends from Idaho, Montana, Oregon, and Washington, each accompanied by color photographs.